Frequently asked questions and definition of terms used in the Patient Safety Act or Rule are summarized here solely for convenience; always rely on the actual text of the Patient Safety Act or Patient Safety Rule in making any determination. The Patient Safety and Quality Improvement Act of 2005 (Patient Safety Act) authorized the creation of PSOs to improve quality and safety by reducing the incidence of events that adversely affect patients. To implement the Patient Safety Act, the Department of Health and Human Services' (HHS) Agency for Healthcare Research and Quality (AHRQ) published the Patient Safety and Quality Improvement Final Rule (Patient Safety Rule). AHRQ has received many questions regarding the implementation of the Patient Safety Rule and about PSOs. In response to these questions, and in anticipation of additional inquiries, below is a list of frequently asked questions and corresponding answers. Which agencies within the Department of Health and Human Services (HHS) implement the Patient Safety Act? Why is AHRQ responsible for the regulation of PSOs? How does AHRQ ensure that a listed PSO is in compliance with the statutory requirements as outlined in the Patient Safety Rule? What role will OCR have regarding the Patient Safety Rule? What is AHRQ's role in providing technical assistance? What are "patient safety activities"? What is Patient Safety Work Product? Do PSOs receive Federal funding? What are the benefits to health care providers who work with a PSO? What is the difference between the "Listed PSO" logo and the "AHRQ Common Formats" logo? How can a hospital utilize the services of a PSO to help reduce readmission rates for various conditions? What if a public entity PSO faces state requirements for disposition of information collected that conflict with the Patient Safety Rule's disposition requirements for PSWP? What is the purpose of the Patient Safety and Quality Improvement Act of 2005 (PSQIA), Public Law 109–41? What specific protections does the Patient Safety Act and Rule provide? What are the privacy and confidentiality protections for PSWP? Can original provider records be protected as PSWP? Can a health care provider work with more than one PSO? If so, is the PSWP protected? Is information submitted to the NPSD safe? What is the importance of the privacy and confidentiality protections for PSWP? What is the relationship between the Patient Safety Rule and the HIPAA Privacy Rule? If a PSO is revoked for cause (i.e., noncompliance with the requirements that each PSO must meet) and a health care provider inadvertently submits data to that entity, is the data protected? How can a health care provider and a PSO exchange information to promote patient safety and quality, while complying with the provisions of the Patient Safety Act and the Patient Safety Rule? Generally, what are the staffing and personnel requirements of a PSO? What expertise is required of a PSO’s appropriately qualified workforce? Is a PSO required to have licensed or certified medical professionals as part of its workforce? When is an individual considered a member of a PSO’s workforce? What is the difference between a PSO’s overall workforce and appropriately qualified workforce members? May a PSO meet the requirement that its appropriately qualified workforce include licensed or certified medical professionals with contracted medical professionals? Is a PSO required to engage with additional experts if the PSO adjusts its activities or areas of focus? What is an example of how a PSO's collection and analysis of patient safety work product could change requiring additional expertise? Is every PSO required to engage a medical doctor to meet the appropriately qualified workforce requirement? Is a PSO required to meet the appropriately qualified workforce requirement when a PSO is not collecting or analyzing patient safety work product? Under what circumstances may a component PSO allow its parent organization to have access to PSWP? What are the circumstances in which a component PSO may not engage an individual or unit of its parent organization in the work of the PSO? What are the requirements if a component PSO wishes to use individuals or units of its parent organization as PSO workforce for assistance in performing patient safety activities? What is a shared staffing agreement? What must be included in a shared staffing agreement? Who can seek listing as a PSO? What are the requirements to be a PSO? Are there additional requirements for a component organization? Are any entities excluded from being listed as a PSO? What is the primary activity requirement for initial listing as a PSO? What can an entity do if it does not meet this primary activity requirement? How does an entity apply to become a PSO? What is the deadline for submitting the forms to become a PSO? Does a PSO listing expire? What are the Common Formats? What is the development and version history of the Common Formats? Will the general public ever have access to the trending data collected or aggregated from PSOs? Why should PSOs contribute PSWP to the NPSD? What information are PSOs required to submit to the NPSD? AHRQ is responsible for the provisions dealing with the listing of PSOs such as administering the certification processes for listing; verifying that PSOs meet their obligations under the Patient Safety Rule; working with PSOs to correct any deficiencies in their operations; and, if necessary, revoking the listing of a PSO that remains out of compliance with the requirements. The Office for Civil Rights (OCR) administers and enforces the confidentiality protections provided to PSWP. Congress vested the authority for implementing the Patient Safety Act with AHRQ by incorporating its provisions into AHRQ's authorizing statute. As the lead Federal agency for patient safety research, AHRQ is an appropriate partner for PSOs and health care providers. The Patient Safety Rule establishes in Subpart B the requirements that an entity must meet to seek listing, and remain listed, as a PSO. The Patient Safety Rule relies primarily upon a system of attestations, which places a significant burden for understanding and complying with these requirements on the PSO. However, the Patient Safety Rule also authorizes AHRQ to conduct reviews (including announced or unannounced site visits) to assess PSO compliance. To assist PSOs in making the required attestations and preparing for a compliance review, AHRQ developed a Patient Safety Organizations: A Compliance Self-Assessment Guide to suggest approaches for thinking systematically about the scope of these requirements and what compliance may mean for an individual PSO. OCR is responsible for the investigation and enforcement of the confidentiality provisions of the Patient Safety Rule. OCR will investigate allegations of violations of confidentiality through a complaint-driven system. To the extent practicable, OCR will seek cooperation in obtaining compliance with the confidentiality provisions, including providing technical assistance. When OCR is unable to achieve an informal resolution of an indicated violation through voluntary compliance, the HHS Secretary has the discretion to impose a civil money penalty (CMP) against any PSO, provider, or responsible person for each knowing and reckless disclosure that is in violation of the confidentiality provisions. The maximum dollar amount of the CMP that can be imposed is updated annually, as described in section 3.404 of the Patient Safety Rule, in accordance with the Federal Civil Monetary Penalty Inflation Adjustment Act of 1990 (Pub. L. 101-140), as amended by the Federal Civil Penalties Inflation Adjustment Act Improvements Act of 2015 (section 701 of Pub. L. 114-74). The amount, as updated, is published at 45 CFR Part 102. AHRQ provides additional information and clarification on the PSO listing process, listed PSOs, the Patient Safety Rule, and other PSO activities, such as the Common Formats. PSOs, health care providers, and other interested parties should contact AHRQ with requests for technical assistance. The Patient Safety Act authorizes AHRQ to list or designate entities as Patient Safety Organizations (PSOs) that attest to having expertise in identifying the causes of, and interventions to reduce the risk of, threats to the quality and safety of patient care. The work of a PSO is not directed by AHRQ. PSOs essentially serve as contractors to providers and a PSO's activities for a provider are usually determined by the Patient Safety Act contract entered into by the parties. The Patient Safety Act establishes criteria for an entity or a component of an entity (component organization) to seek listing as a PSO by AHRQ. The primary activity of an entity or component organization seeking to be listed as a PSO must be to conduct activities to improve patient safety and health care quality. A PSO's workforce must have expertise in analyzing patient safety events, such as the identification, analysis, prevention, and reduction or elimination of the risks and hazards associated with the delivery of patient care. See Patient Safety Rule Section 3.102 for the complete list of requirements. The term "safety" refers to reducing risk from harm and injury, while the term "quality" suggests striving for excellence and value. By addressing common, preventable adverse events, a health care setting can become safer, thereby enhancing the quality of care delivered. PSOs create a secure environment where clinicians and health care organizations can collect, aggregate, and analyze data, thus identifying and reducing the risks and hazards associated with patient care and improving quality. PSWP is the information protected by the privilege and confidentiality protections of the Patient Safety Act and Patient Safety Rule. PSWP may identify the providers involved in a patient safety event and/or a provider employee that reported the information about the patient safety event. PSWP may also include patient information that is protected health information as defined by the Health Insurance Portability and Accountability Act (HIPAA) Privacy Rule (see 45 CFR 160.103). PSOs do not receive Federal funding. PSOs serve as independent, external experts who can assist providers in analyzing data that a provider voluntarily chooses to report to the PSO. Providers that work with a PSO can benefit from the ability of PSOs to aggregate data from all of the providers reporting to the PSO, enabling many PSOs to develop the large numbers of patient safety events essential for identifying the underlying causes of infrequent, but often tragic, adverse events. The Patient Safety Act and Rule provide protections that are designed to allay fears of providers of increased risk of liability if they voluntarily participate in the collection and analysis of patient safety events. The uniform Federal protections that apply to a provider's relationship with a PSO are expected to remove significant barriers that can deter the participation of health care providers in patient safety and quality improvement initiatives, such as fear of legal liability or professional sanctions. AHRQ has published a short brochure, "Choosing a Patient Safety Organization," to help providers select a PSO appropriate to their needs. PSOs that are currently listed by Secretary are entitled to display the "Listed PSO" logo. This logo is intended to identify entities whose PSO certifications have been accepted in accordance with Section 3.104(a) of the Patient Safety Rule. Before working with a PSO, however, health care providers are encouraged to review AHRQ's directory to confirm that the entity being considered is still a listed PSO. The "AHRQ Common Formats" logo may be displayed by any organization that is using the Common Formats developed by AHRQ. Such entities do not need to be listed as a PSO by the HHS Secretary to employ the Common Formats and thus display the logo. The Common Formats are available in the public domain to facilitate their widespread adoption and implementation. Entities that display the logo should use the Common Formats as a whole; however, entities that have a limited focus may use the Common Formats that pertain only to that area. For hospitals with high risk-adjusted readmission rates for certain conditions, the Affordable Care Act contains provisions that are aimed at decreasing those rates. The law states that these hospitals may enlist PSOs to help reduce their rates. The PSO readmissions Web page contains helpful information and tools that can be used by such hospitals, and PSOs that work with those hospitals, to address the causes of unnecessary readmissions. In fact, any hospital can work with a PSO on any patient safety issue of the hospital's choice. Because services offered by PSOs to help reduce readmissions will vary, AHRQ recommends consulting a PSO's Web site to determine if that PSO is offering such assistance. Hospitals that wish to identify factors associated with unnecessary readmissions are encouraged to consider using Common Format–Readmissions Version 0.1 Beta. This standardized Common Format allows hospitals to aggregate data on readmissions. In addition, hospitals can compare their data to others and analyze trends on a community, regional, and national level. To access Common Formats–Readmissions Version 0.1 Beta, go to the Patient Safety Organization Privacy Protection Center (PPC) Web site. Learn more about the Common Formats. What is the purpose of the Patient Safety and Quality Improvement Act of 2005 (PSQIA), Public Law 109-41? The purpose of the Act is to encourage providers to work voluntarily with new organizations, known as Patient Safety Organizations (PSOs), to improve patient safety and to reduce the incidence of events that adversely affect patients. Often referred to as the Patient Safety Act, the provisions of this law dealing with PSOs are administered by the Agency for Healthcare Research and Quality (AHRQ) and the provisions dealing with its confidentiality protections are interpreted and enforced by the Office for Civil Rights (OCR). For more information on the Act and how organizations can become PSOs, go to the Web site: https://pso.ahrq.gov. The Patient Safety Act and Rule provide privilege and confidentiality protections to specific types of information developed when a provider works with a PSO, such as the data collected and reported to PSOs by providers and the communications and feedback a provider receives from the PSO. Subject to certain specific exceptions, PSWP may not be used in criminal, civil, administrative, or disciplinary proceedings. PSWP may only be disclosed pursuant to an applicable disclosure permission specified in the rule. (see Patient Safety Rule Section 3.206). The Patient Safety Act and Rule make PSWP privileged and confidential. Subject to certain specific exceptions, PSWP may not be used in criminal, civil, administrative, or disciplinary proceedings. PSWP may only be disclosed pursuant to an applicable disclosure exception (see Patient Safety Rule Section 3.206). A patient's original medical record, billing and discharge information, and any other original patient or provider records cannot become PSWP. Copies of selected parts of original provider records may become PSWP. The Patient Safety Rule permits a health care provider, such as a hospital, to work with more than one PSO. Any information that is eligible to become PSWP reported to a PSO by a health care provider is protected. The definition of PSWP (Patient Safety Rule Section 3.20) provides important detail on what information is eligible for protection and when those protections apply. Yes. PSWP must be nonidentified before it is submitted to the NPSD. Nonidentification requires that the information identifying individual and institutional providers, patients, and provider employees reporting patient safety events be removed from the PSWP. The Patient Safety Act makes PSWP privileged and confidential. The Patient Safety Act and the Patient Safety Rule generally bar the use of PSWP in criminal, civil, administrative, or disciplinary proceedings except where specifically permitted. Strong privacy and confidentiality protections are intended to encourage greater participation by providers in the examination of patient safety events. By establishing strong protections, providers may engage in more detailed discussions about the causes of adverse events without the fear of liability from information and analyses generated from those discussions. Greater participation by health care providers will ultimately result in more opportunities to identify and address the causes of adverse events, thereby improving patient safety overall. PSWP may contain individually identifiable health information as defined in the HIPAA Privacy Rule. Health care providers that are HIPAA-covered entities must comply with the use disclosure exceptions for PSWP as well as the permissions and disclosure requirements concerning protected health information (PHI) set forth by the HIPAA Privacy Rule, as well as the limitations on the disclosure of information found in the Patient Safety Rule when disclosing PSWP. PSOs that are business associates of HIPAA-covered entities are subject to the limitations on the use and disclosure of PHI. Also, a PSO is a business associate of a HIPAA-covered provider subject to the business associate requirements of the HIPAA Privacy Rule. If a PSO's listing is revoked for cause, health care providers may continue to submit data to the delisted PSO for 30 calendar days, beginning on the date and time that the PSO is delisted and ending 30 days thereafter. Data submitted during this 30 day period are treated as PSWP and are subject to the confidentiality and privilege protections of the Patient Safety Act. For example, if a PSO is delisted for cause at midnight on March 1, a health care provider can continue to submit data to the delisted PSO until midnight on March 31 and the data will be protected. Data submitted to the former PSO after midnight on March 31 would not be protected. All PSWP submitted to a former PSO in accordance with provisions of the Patient Safety Act and Patient Safety Rule remains protected after the PSO ceases operations. This diagram, Working with a PSO: One Approach, AHRQ Publication No. 13-PS-018, illustrates how information can flow between a provider and its PSO-primarily, between the provider's patient safety evaluation system (PSES) and the PSES of the PSO. A provider PSES manages the collection of information for reporting to a PSO. 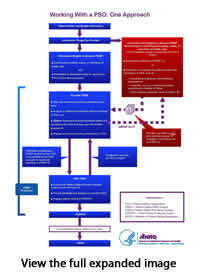 The diagram shows the flow of protected information, to be handled as PSWP. PSWP analyzed by the PSO forms the basis of protected recommendations from the PSO to the provider. PSWP can undergo nonidentification for combination with data from other PSOs, to become publicly accessible. There are two provisions in the Patient Safety Rule that address requirements for a PSO to maintain personnel for PSO operations. First, a PSO must have appropriately qualified workforce members, including licensed or certified medical professionals, as described in the PSO listing criteria at 42 CFR 3.102(b)(2)(i)(B). Second, a PSO is required to conduct patient safety activities, including the utilization of qualified staff, as described at 42 CFR 3.20. What expertise is required of a PSO's appropriately qualified workforce? HHS interprets a PSO's requirement to have an appropriately qualified workforce to mean that a PSO is expected to maintain workforce members that have sufficient expertise to be able to perform patient safety activities, such as the analysis of patient safety work product, and other services offered as a PSO. Yes, part of the PSO's requirement to have an appropriately qualified workforce includes that the PSO must have workforce members who are licensed or certified medical professionals, and they must be appropriately qualified. An example of a licensed medical professional being appropriately qualified for the work of the PSO would be a PSO specializing in pediatric safety events that has a currently licensed medical professional with relevant knowledge, expertise, and experience in pediatrics as a workforce member. If the same PSO specializing in pediatric safety events maintains a geriatrician as the only workforce medical professional, the PSO would have an insufficiently qualified workforce. When is an individual considered a member of a PSO's workforce? The Patient Safety Rule defines a workforce member as an employee, volunteer, trainee, contractor, or other person whose conduct is under the direct control of an entity. For an individual to be part of a PSO's workforce, the individual must be under the direct control of the PSO. For more information about the direct control requirement, see the Notice of Proposed Rule Making preamble discussion at 73 FR 8158-8159 (February 12, 2008) discussing the Federal Common Law of Agency. What is the difference between a PSO's overall workforce and appropriately qualified workforce members? A PSO's workforce includes any individual whose conduct is under the direct control of the PSO. It could include individuals not directly involved with the conduct of patient safety activities, such as workforce members that are involved in routine administrative operations that do not involve or impact the required certifications of a PSO. HHS interprets the Patient Safety Rule's requirement for PSOs to have appropriately qualified workforce members to concern the qualifications possessed by a PSO's workforce to provide appropriate collection and analysis of patient safety work product. Yes, a PSO may meet this aspect of the appropriately qualified workforce requirement by contracting with individuals as long as the individuals are workforce members, meaning they are under the direct control of the PSO. A contractor that is not under the direct control of the PSO is not a workforce member for purposes of the appropriately qualified workforce requirement. For more information about the definition of workforce member and the direct control requirement, see the Notice of Proposed Rule Making preamble discussion at 73 FR 8158-8159 (February 12, 2008) discussing the liability of a principal and the Federal Common Law of Agency. A PSO may be required to engage additional qualified workforce members as the activities, services, and subject matter of the collection and analysis of patient safety work product performed by a PSO change. A PSO is required to maintain qualified workforce members that have sufficient expertise to be able to perform the collection and analysis of patient safety work product throughout the duration of the PSO's listing. If the nature of services or subject matter of patient safety work product collected and analyzed by a PSO changes, a PSO is required to ensure that its qualified workforce is appropriate for such changes. A PSO should periodically assess whether its qualified workforce is appropriate for the services it performs to maintain listing. If a PSO only engages in the collection and analysis of patient safety work product involving non-institutional pediatric safety events, the PSO's requirement to have an appropriately qualified workforce would be satisfied by a currently licensed pediatrician who is a member of the PSO's workforce and has sufficient knowledge, expertise, and experience related to non-institutional pediatric safety events. If the PSO were to broaden its scope through a contract for the collection and analysis of patient safety work product at a local nursing home, the PSO should assess whether the medical expertise of the PSO's workforce includes sufficient knowledge, expertise, and experience to address nursing home safety events. If the only workforce member with medical knowledge, expertise, and experience is the pediatrician and the pediatrician has insufficient medical knowledge, expertise, and experience regarding nursing homes, the PSO would not have a qualified workforce that is appropriate to collect and analyze patient safety work product involving nursing homes. By contrast, if the PSO also had a currently licensed geriatrician as a member of the workforce, the PSO may meet the appropriately qualified workforce requirement depending upon the knowledge, expertise, and experience of the geriatrician. No, the Patient Safety Rule requires that a PSO's appropriately qualified workforce includes "licensed or certified medical professionals." Medical doctors are just one example of licensed or certified medical professionals who may meet this requirement. HHS interprets the Patient Safety Rule as requiring a PSO to have a qualified workforce that is appropriate for the collection and analysis of patient safety work product performed by that PSO, and the health care industry utilizes many individuals with a wide variety of expertise to perform activities and services throughout a wide range of delivery modalities. Depending upon the specific activities and services to be performed by the PSO, medical doctors and/or other licensed or certified medical professionals with sufficient expertise to be able to perform the PSO's patient safety activities may satisfy the PSO's requirement to have appropriately qualified workforce members. Yes, a PSO is required to meet the appropriately qualified workforce requirement at all times that a PSO is listed. This includes periods when a PSO is not collecting or analyzing patient safety work product. A component PSO may only disclose PSWP to its parent organization (emphasis added) if permitted by an applicable exception to confidentiality in section 3.206 of the Patient Safety Rule. (2) A component PSO to another entity or natural person outside the component PSO and within the legal entity of which the component PSO is a part. The Patient Safety Rule requires that a component PSO maintain PSWP separately and securely from the rest of the parent organization of which it is a part. A component PSO must require that members of its workforce and any other contractor staff not make unauthorized disclosures of patient safety work product to the parent organization(s). If the conditions of section 3.102(c)(3) and, when applicable, of section 3.102(c)(4)(ii)(B) of the Patient Safety Rule are met, a component PSO may permit individuals or units from its parent organization to serve in the capacity of PSO workforce member to assist the component PSO in its conduct of patient safety activities. Workforce means employees, volunteers, trainees, contractors, or other persons whose conduct, in the performance of work for a provider, PSO or responsible person, is under the direct control of such provider, PSO or responsible person, whether or not they are paid by the provider, PSO or responsible person. Access to PSWP by component PSO workforce members within the PSO is considered a use of PSWP and not a disclosure (emphasis added). If individuals or units of the parent organization serve as PSO workforce, they may only use or disclose the PSWP in their capacity as component PSO workforce members. In general, a component PSO may not share staff with its parent organization (i.e., utilize individuals or units from its parent organization in the work of the PSO) if the parent organization is ineligible for PSO listing as an excluded entity (i.e., one of the types of entities listed in section 3.102(a)(2) of the Patient Safety Rule). A health insurance issuer may not form a component PSO, but the other excluded entities listed in 3.102(a)(2)(ii) may do so. If the component PSO's parent is an excluded entity that is permitted to form a component PSO, the PSO may utilize only individuals or units of its parent organization that are not involved in the ineligible activities (see 3.102(c)(4)(ii)(B)). All of the requirements at section 3.102(c)(3) must also be met, including the requirement to have a written agreement with each such individual or unit. A component PSO that wishes to use eligible individuals or units of its parent organization as PSO workforce must comply with all of the applicable requirements in section 3.102(c) of the Patient Safety Rule. These include a requirement to enter into written agreements that contain the content specified in section 3.102(c)(3), also known as "shared staffing agreements," and restrictions on entering into such agreements with certain individuals or units if the parent organization is an excluded entity. The term "shared staffing agreement" describes the written agreement required by section 3.102(c)(3) of the Patient Safety Rule to permit a component PSO to provide access to identifiable PSWP to an individual or unit of its parent organization for assistance in conducting patient safety activities. conducting the mission of the PSO without creating conflicts of interest. The Patient Safety Rule permits many types of entities-either an entire organization or a component of an organization, a public or private entity, a for-profit or not-for-profit entity-to seek listing as a PSO. Both the mission and the primary activity of the entity (or component) must be to conduct activities to improve patient safety and the quality of health care delivery (Patient Safety Rule Section 3.102(b)(2)(i)(A) and Patient Safety Rule Section 3.102(b)(2)(ii)). The Patient Safety Rule requires an entity to certify that it meets 15 distinct statutory requirements; a component of another organization must attest that it meets another three statutory requirements; and each entity or component organization must comply with several additional regulatory requirements. Every entity seeking to be a PSO must certify to AHRQ that it has policies and procedures (see Policies and Procedures—Topics to Address; PDF File, 76 KB) in place to perform the eight patient safety activities specified in the Patient Safety Rule. The Patient Safety Rule also establishes several additional requirements (see Patient Safety Rule Section 3.102(a)). The Patient Safety Act excludes a health insurance issuer or a component of a health insurance issuer from becoming a PSO. The Patient Safety Rule also excludes the following entities: regulatory agencies; organizations that serve as agents of regulatory agencies (e.g., entities that carry out inspections or audits for a regulatory agency); accreditation and licensure entities; and entities that administer a Federal, State, local, or tribal patient safety reporting system to which health care providers are required to report by law or regulation (see Patient Safety Rule Section 3.102(a)(2)). Entities submitting certifications for initial listing need to attest that they meet the requirement that both their mission and their primary activity are to conduct activities to improve patient safety and the quality of health care delivery (Patient Safety Rule Section 3.102(b)(2)(i)(A) and Patient Safety Rule Section 3.102(b)(2)(ii)). A multi-purpose entity with a broader scope can create or designate a component that more clearly meets the mission and primary activity criterion. The component of that entity can then seek listing. AHRQ has prepared a PSO Certification for Initial Listing form that an entity must use to certify that it meets the requirements to become listed as a PSO. There is no deadline for applying to be listed as a PSO. Applications for PSO status will be accepted at any time and will be reviewed as expeditiously as possible. A PSO is listed for a period of 3 years. To renew its listing for an additional 3 years, the PSO will be required to complete and submit a PSO Certification for Continued Listing form before the expiration of its period of listing. The PSO must certify that it is performing, and will continue to perform, each of the patient safety activities and that it is complying with, and will continue to comply with, the other requirements of the Patient Safety Rule. The PSO's 3-year period of listing will automatically expire at midnight of the last day of the PSO's listing period if AHRQ has not received and approved the PSO's continued listing form. The Patient Safety Act and Rule recognize that aggregation of patient safety events requires the use of common definitions and reporting formats. To facilitate the collection and reporting of patient safety events envisioned by the Patient Safety Act, AHRQ developed, and is continuing to expand develop, Common Formats for use in multiple health care settings by health care providers and PSOs. However, it is important to recognize that Common Formats can be used by providers and other organizations that do not work with a PSO but are dedicated to improving care quality. Currently, the Common Formats are limited to patient safety reporting in three settings of care—acute care hospitals, community pharmacies and skilled nursing facilities. AHRQ recently released Common Formats for Surveillance–Hospital for public review and comment. Until now, Common Formats have been designed to support only traditional event reporting. Common Formats for Surveillance–Hospital are designed to provide, through retrospective review of medical records, information that is complementary to that derived from event reporting systems. These Formats will facilitate improved detection of events and calculation of adverse event rates in populations reviewed. Learn more about the Common Formats, or access the most current versions of the Common Formats, please go to http://www.psoppc.org. In collaboration with the Federal Patient Safety Workgroup (PSWG), the National Quality Forum (NQF), and the public, AHRQ has developed Common Formats for two settings of care—acute care hospitals and skilled nursing facilities. To develop the Common Formats, AHRQ first reviewed existing patient safety event reporting systems from a variety of health care organizations. Working with the PSWG and Federal subject matter experts, AHRQ and the PSWG developed, piloted, drafted, and released Version 0.1 Beta of the Common Formats (for acute care hospitals) in August 2008. Through a contract with AHRQ, NQF solicited feedback on Version 0.1 Beta from private sector organizations and individuals. The NQF, a nonprofit organization that focuses on health care quality, then convened an expert panel to review the comments received and provide feedback. Based on the NQF's feedback, AHRQ, in conjunction with the PSWG, further revised the Common Formats and released Version 1.0 in September 2009. The review process above was repeated to further refine the Common Formats and to incorporate any public comments on Version 1.0 prior to finalization of the technical specifications for electronic implementation. These modified formats for acute care hospitals were made available as Version 1.1 in March 2010. In conjunction with the Food and Drug Administration (FDA), the Office of the National Coordinator for Health Information Technology (ONC), and the full PSWG, AHRQ revised the device event-specific Common Format (available in Version 1.1) to include patient safety events related to Health Information Technology (HIT). This Common Format, Device or Medical/Surgical Supply including HIT Device (Version 1.1a), was released in October 2010. AHRQ and the PSWG released Common Formats for skilled nursing facilities in March 2011, and in November 2011, an additional module (Beta Version) for venous thromboembolism (VTE) was incorporated that includes both deep vein thrombosis (DVT) and pulmonary embolism (PE). In April 2012, AHRQ and the PSWG developed Common Formats-Hospital Version 1.2, which featured new content to incorporate the Event-Specific Formats VTE and Device/HIT. In July 2012, Common Formats–Readmissions Version 0.1 Beta was released to allow hospitals to aggregate data and analyze readmission attributes. Most recently, AHRQ released Common Formats for Surveillance-Hospital. Until now, Common Formats have been designed to support only traditional event reporting. Common Formats for Surveillance–Hospital are designed to provide, through retrospective review of medical records, information that is complementary to that derived from event reporting systems. These formats will facilitate improved detection of events and calculation of adverse event rates in populations reviewed. As more providers and PSOs are able to aggregate data using the Common Formats developed by AHRQ, the Patient Safety Act authorizes AHRQ to facilitate the development of a network of patient safety databases that will aggregate nationally non-identifiable data on patient safety events. The goal of this effort is to enable better identification of trends and permit analysis of the underlying causes of even the rarest patient safety events. The Act permits, but does not require, PSOs, health care providers, or others to voluntarily contribute nonidentifiable data to this effort. The Patient Safety Act also directs AHRQ to incorporate this nonidentifiable trend data in its annual National Health Care Quality Report (NHQR). The NHQR is available in hard copy and electronically on the AHRQ Web site at https://www.ahrq.gov/research/findings/nhqrdr/index.html. By enabling PSOs to aggregate PSWP on their own and to contribute nonidentifiable PSWP to the NPSD, the stage has been set for breakthroughs in our understanding of how best to improve patient safety. The NPSD will facilitate the aggregation of sufficient volumes of patient safety event data to identify more rapidly the underlying patterns and causes of risks and hazards associated with the delivery of health care services. By contributing nonidentifiable PSWP to the NPSD, PSOs can accelerate the pace at which the NPSD can advance our knowledge and provide an important adjunct to a PSO's own analyses. PSOs are not required to submit any information to the NPSD.